Philosophy, of all disciplines, should never embrace dogmas—it is supposed to be the quintessentially critical subject—and yet now we’re full to the brim with them. You cannot criticize or even question the current orthodoxies regarding race, gender, or sexual orientation within the institutional framework of academic philosophy. Those are the words of philosopher Dan Kaufman of Missouri State University (not to be confused with Dan Kaufman of the University of Colorado, Boulder), in an interview with Cliff Sosis (Coastal Carolina) at What Is It Like To Be A Philosopher? You may know Professor Kaufman from his philosophical work, his writing at the The Electric Agora, a site he co-founded, and, of course, his commenting here at Daily Nous (he is among the 5 most frequent commenters here). The interview is interesting and at times even entertaining, and I recommend reading it. To comment on one aspect of it, it is striking just how different Kaufman’s view of contemporary academia and contemporary culture is compared to mine. The quote at the top about being unable to “question the current orthodoxies” in philosophy strikes me as plainly false. His prime example of this is the controversy over Rebecca Tuvel’s paper on transracialism. But note that the article was accepted for publication in the leading journal of its kind, and though there were some calls to retract it, these calls were resisted by the editors of the journal (and criticized by other visible voices in the profession), and the article remains in print. If Tuvel’s paper gives us an example of questioning current orthodoxy, it shows that it’s false that philosophers today are unable to question current orthodoxy. I will admit that, during this controversy, (in my opinion) some people behaved poorly and acted carelessly, but there was also incredibly vigorous intellectual discussion and debate going on, as well as lots of learning. Perhaps most importantly, the Tuvel controversy was so unusual it is odd to use it as representative of what is wrong with philosophy today. Kaufman’s other example is a paper of his, which he has had difficulty placing, in which he argues against ethical veganism. I guess I missed the memo informing us that veganism is now orthodoxy in philosophy. Even if there are better examples by which one might try to make the case that it is difficult to publish works that question current orthodoxies (e.g. ), it is hard to determine whether the problem with these papers is that they question orthodoxies, or something else. We can then see if we have enough examples with which to plausibly describe philosophy as “full to the brim”—or even halfway to the brim—with unquestionable orthodoxies. Again, I found myself thinking that we inhabit different worlds. Humorless? There is more, better, and more varied humor in the world being created and enjoyed now than at any other time in human history, on more subjects (targets) than ever before, and in more formats and media than ever before. As with any art form, but perhaps especially with comedy, tastes change, but that’s no basis for thinking our culture has less humor, let alone thinking our culture is humorless. And “precious”? Maybe I don’t know what Kaufman has in mind—a kind of Victorian sensitivity to offense?—but people, come on. We are living in what, in many ways, is the most disgusting era of humankind. I mean, have you seen the internet? Anyway, there’s more to the interview than just this stuff. The whole thing is here. 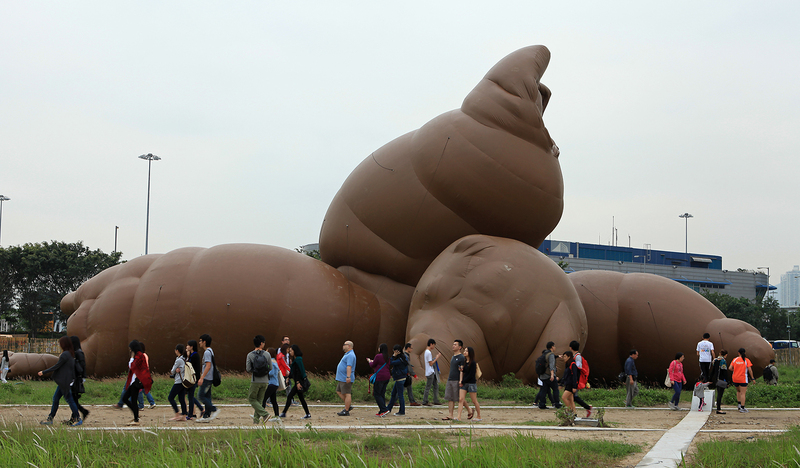 photo of people viewing or blithely walking by “Complex Pile,” an installation by artist Paul McCarthy.